[Toronto, ON] – Toronto’s Downtown Yonge Neighbourhood will welcome some awesome entertainers as Epilepsy Toronto, in partnership with the Downtown Yonge BIA, announces more new and returning acts at its signature fundraising event, Toronto International BuskerFest for Epilepsy, presented by Scotiabank. The 16th edition of the festival – the largest of its kind in North America and the world’s biggest epilepsy fundraising event – runs Thursday, August 27 to Sunday, August 30, throughout the Yonge Street corridor, from Queen to College Street (which will be closed to traffic) and surrounding areas (including Yonge-Dundas Square). With more entertainers than ever before, this year’s BuskerFest – the last major festival of the summer season – promises to be the biggest and best yet. There are over 170 world-class performers in more than 70 acts from across Canada and around the globe. Last year, well over 1.5 million spectators enjoyed daredevil stunts, fire manipulations, acrobatics, aerial acts, music, magic, comedy, contortion, dance, balloon creations, mime and some acts that defied description. New this year is the Family Fun Zone with great activities for the younger kids and performances by some of the festival’s silliest buskers! Guests are asked to donate at the gate to Epilepsy Toronto. Buskers retain proceeds from “the hat” passed after their performances except for shows on the Scotiabank Stage in Yonge-Dundas Square, where each act will do a benefit performance with all proceeds going to Epilepsy Toronto. In 2014, BuskerFest raised $250,000, and Epilepsy Toronto is hoping donations exceed that this year. o Steven Brundage (U.S.) – This hilarious and family-friendly magician has been featured on “Good Morning America” and just over two weeks ago “fooled” Penn and Teller with his incredible Rubik’s Cube act on their hit show “Fool Us.” The YouTube video (https://www.youtube.com/watch?v=BwDAXC0_Bxk ) of the Penn & Teller appearance has garnered over 1.6 million views since it was posted on July 7.
o Catwall Acrobats’ Trampo Wall (Quebec) – An international troupe based in La Belle Province featuring some of the best trampoline-wall performers in the world. Trampoline-wall is a new extreme sport where acrobats jump on their backs on a trampoline and seemingly defy gravity by walking up a vertical wall over 2 storeys high. o Mirror Family (Austria/Slovakia) – Their entire bodies are covered head to toe with hundreds of mirrors, reflecting the light of the world right back upon their viewers. o Mr. B’s Joybox Express (U.S.) – A 385-lb. piano on a bicycle led by renowned blues and boogie-woogie pianist Mr. B. Powered by three riders, in 2014, Joybox completed a 1,840-mile ride along the entire length of the Mississippi River. o Zap Circus (Australia) – This internationally awarded, high-energy circus and fire duo have wowed audiences across the globe. Tarrabelle and Rusty lead audiences on a hilariously death-defying adventure, culminating in an unbelievable finale of Acrobatics, Fire and Stupidity! o Jack Miron (Toronto) – A talented young performer who juggles balls, fire, cupcakes and more while unicycling and tumbling. Catch him performing in the Family Fun Zone. o Steve Stergiadis (GTA) – This international circus artist performs a high-energy comedy show that mixes clowning, hat juggling and unicycle. o The LOL Brothers (Quebec/Peru) – Taking audiences on a tour of the history of rock ‘n’ roll music that is both graceful and unusual, brothers Acee and DeeCee perform electrifying circus numbers mixing risk and humour. o Billions Cobra (Toronto) – Awash with flames, the Billions Cobra show features amazing acts of body contortion and precision whip cracking, punctuated with some creative dance moves. o Kromatik (Quebec) – Performing for over 20 years throughout North America, Europe and Asia, Kromatik has earned a reputation as one of the most sought-after body artists in the world. o Oparty (Toronto) – The ultimate party superhero, Oparty is the defender of good times and destroyer of the bad, performing fun party stunts. Guaranteed to entertain! o Pyromancer (Netherlands) – An incredible fire-breather performs an unusual fire show that mixes good laughs with spectacular flames. o USA Break Dancers – A high-energy interactive show created by former Cirque du Soleil member Julio “Klown” Santiago. Winners of 7 People’s Choice Awards at fests around the world. o Wacky Chad (U.S.) – Laugh until it hurts as stunt comedian Wacky Chad rides another person on his tiny bicycle and handstands on a skateboard. Donate at the gate to Epilepsy Toronto, a non-profit organization dedicated to helping more than 40,000 Torontonians with epilepsy and their families through counselling, employment support, advocacy and education. Stay tuned for an announcement about the fantastic musical acts that will be featured at this year’s festival! Below find the previously announced acts. o Bex In Motion (Toronto) – With fire, swirls and hoops, Bex takes audiences on a journey through motion using acrobatic tricks, fire poi, double staff and multiple fire hoops. o Catana’s Colorful Chalk Art (U.S.) – Catana has spent the last 10 years creating artwork on paper and the last two years creating colourful artwork on pavement. o Funnykito Show (Brazil) – In his North American debut, Dan Marques’ award-winning performance is a captivating and enchanting comedy magic and illusion show that has made audiences cry with laughter in over 30 countries. o Lords of Strut (Ireland) – Winner of the 2013 Street Performers World Championship, this high energy acrobatic show, with break dancing, contortion, acrobatic ladder, acrobalance and very original comedy, is a parody of celebrity culture. Sometimes subtle, sometimes brash, but always bright, tight and incredibly funny! o Lulu’s World (Italy) – Appearing for the first time in North America, Lulu is a street artist who can’t be contained in any gallery. Enter her world of make believe, where magic happens right in front of you with scenes pouring from Lulu’s pen onto paper, turning the 2D world of sketching into a 3D experience for the child in all of us. o Jenny Jupiter (Toronto) – Jenny performs her living statue act combining mime and movement technique, unique and spectacular costumes, music and a dash of clowning. o Mighty Mike (Toronto) – The Strongman Juggler with fantastic feats to flabbergast you and daring displays of dexterity to dazzle you. Watch as he hammers a nail in a board with his bare hand! o Mute (Thailand) – Making their North American debut, this “Romantic Comedy Clown-Mime” duo tell fun and easy-to-understand stories for all ages and nationalities – sure to touch hearts. o Alakazam (Australia) – The “Human Knot” returns to comically contort his body and perform sky-high feats of danger and cheeky comedy. o Bence Sarkadi (Hungary) – This grand puppeteer’s “The Budapest Marionettes” show features a range of uniquely different marionettes in a cycle of short stories accompanied by music. o Chalk Chick (Toronto) – Brings the streets of Toronto colourful sidewalks, love and joy. o Dream State Circus (Australia) – This Aussie/English couple perform acrobalance, juggling and dynamic high skill fire manipulations; a fiery act with fiery chemistry! o Fireguy (Toronto) – Ever-popular entertainer who mixes skateboard tricks and fire stunts. o Hercinia Arts Collective (GTA) – With two performances: Gargoyles, part guerilla aerial, part human statue and part theatrical character, and their new aerial show, The Flying Machine, the story of a quirky inventor who is constantly creating new machines to propel movement in all directions. o Isabella Hoops (Toronto) – A circus performer whose charm, flirtatious energy and unique humour are unforgettable. o Kate Mior (Toronto) – Internationally acclaimed living statue with a stunning array of characters and personalities. o Lacey Lucidity (Toronto) – Leaves audiences mesmerized by the beauty of crystal balls as she tosses them gracefully and rolls them magically along her body. o MaracaTall (Toronto) – A high energy, high impact troupe of stilt drummers with choreographed moves and colourful costumes. o Max T. Oz (GTA) – Sleight-of-hand magic favourite. o Mental Floss Side Show (Toronto) – A vaudevillian duo with exhibits from the five corners of the globe. o Mr. Twister (Toronto) – A young man who delights thousands with amazing balloon creations. o Nathanial Rankin (Toronto) – International award-winning circus artist who combines state-of-the-art modern magic, juggling, mind reading, comedy, audience participation, dangerous stunts and a sharp wit. o Natural Wings (Australia) – Natural Wings mesmerizes as this female acrobatic trio goes high in the sky to perform a variety of aerial dances, filled with high skills, strength and grace. o The Giant Seagulls (Australia) – With working beaks, these pesky but lovable birds will be rummaging in bags and pockets, stealing food from plates and picnic baskets, causing chaos as usual. o The Sauruses (Netherlands) – All the way from the Cretaceous Period by way of modern-day Holland, these beautiful, larger-than-life dinosaurs return to fascinate and awe with their absolutely thrilling performance, just watch out for snapping dino jaws! o The Silent Violinist (GTA) – Combines balloons and mime, dressed in her visually stunning balloon dress with a gigantic wingspread. o The Twisted Ones (GTA) – Led by three-time World Champion Balloon Twister Debbie Stevens, this incredible family creates awesome balloon creations, from the tiniest ladybug to a giant gorilla. o Witty Look (Japan) – DAIKI, the former unicycle world champion, and his partner, the acrobat clown CHEEKY, pair up to create a comic act that is a fusion of the cartoon world and high-level unicycle skills. o Yo-K (Toronto) – Kohel Mintz, the yo-tastic teenager who amazes people with his mind-boggling yo-yo skills. Yonge Street all the way from Queen to College and surrounding areas (including Yonge-Dundas Square). Thursday, noon – 11 p.m.; Friday, noon – 11 p.m.; Saturday, 11 a.m. – 11 p.m.; Sunday, 11 a.m. – 8 p.m. Check the website for more information and updates on the full line-up of performers: torontobuskerfest.com. Since its inception in 2000, Toronto International BuskerFest for Epilepsy has featured hundreds of the best street performers from around the world, hosted millions of amazed spectators and helped raise much-needed funds for Epilepsy Toronto. BuskerFest is the largest street performers’ festival in North America and is the largest Epilepsy awareness-raising event in the world. Tap Dancing Priests Battle? More Like Tap Dance Vs. Irish Step Dancing! 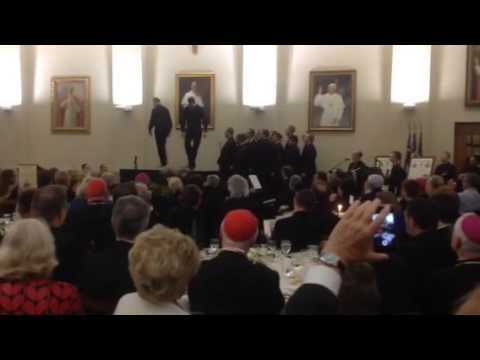 10/29/2014 Clyde F. Smith Comments Off on Tap Dancing Priests Battle? More Like Tap Dance Vs. Irish Step Dancing!